YOU CAN MAKE THIS IN 20 MINUTES!!!! This recipe is so simple and delicious. Grab a can of albacore tuna in water and your favorite can of organic beans and have a meal on the table in less than 30 minutes. Heat a large skillet and spray with PAM, or other oil spray. Chop the peppers and onion and add to the skillet. Sprinkle a little taco seasoning over the onion and peppers. Cook and fork stir until the peppers look a bit roasted and onions release juices. I am a taster at this point, so go right ahead and check the flavor and see if it is to your liking. Pour the pepper/onion mixture into a bowl and cover with foil to keep warm. In the same heated pan, you will be splitting the pan in 1/2, tuna on one side and beans on the other. Add the drained tuna on one side and begin forking apart. Add the beans on the other side. If they mix a bit, no big deal. Pour a bit of salsa over the tuna and sprinkle with a bit of taco seasoning mix and crushed red pepper, add a bit of jalapeno juice from the jar, and combine all the flavors. Again, taste test to see if the fish is to your liking and add more spices if desired. On the bean side, add a bit of salsa to the beans and keep stirring to heat through. I sometimes add a bit of the taco seasoning mix to the beans as well. Once everything is heated through, the tacos are ready to prep. Heat a griddle prepared with PAM or other oil to warm the tortillas. 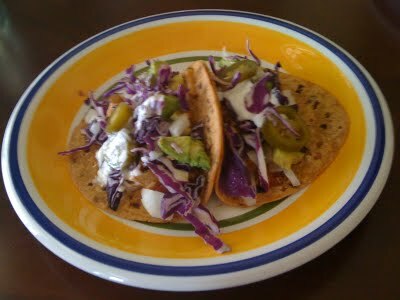 Have ready the sliced avocado, remaining onion, bag of shredded red cabbage, plain Greek yogurt, and jalapenos (optional). Remove heated tortillas from the griddle and start building this healthy taco, fish and beans first, add cooked pepper and onions, a dab of yogurt, fresh chopped onion, jalapenos, shredded red cabbage and avocado. This will be messy good! Have a fork on standby to not miss what drops on your plate.